An intelligent liquid crystal displays which could bring mobile DNA fingerprinting a step closer has been developed by scientists. Joint research between Cambridge University scientists and Epson has yielded an intelligent, ultra-thin display device which combines clever circuitry and sensors. The sophisticated device can take samples either through touch or in liquid form, then analyse and store the information. The technology could be used on a range of wireless mobile devices, like handheld computers or even wrist watches. The scientists who have been researching liquid crystal display (LCD) technology say the wafer-thin sensing displays are about the size of a film negative. The technology could be used in a range of testing and sampling applications. "Thin Film Transistors (TFT) can be seen as an intelligent version of LCD technology," Professor Piero Migliorato at the University of Cambridge told BBC News Online. "The TFT will have an intelligent chip inside programmed to do a set job, be it reading people's fingerprints or telling a person's blood type in the future." The chip technology behind the display will be able not only to store but also to analyse information. It means in the future, police equipped with mobile devices could take DNA fingerprinting samples from people when they are on the beat. This could make it is a lot easier for samples to be recorded and stored, and raises the possibly of using wireless technology to compare database information with samples. TFTs are often used to make screens for computers, and this development of it is a result of a long term collaborative research effort between Cambridge University and technology giants Epson. 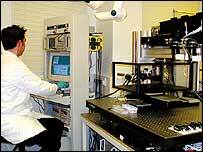 The University's Epson lab was set up in 1998 to encourage cross-fertilisation of academic and professional research and development. The technology could be seen as timely with legislation on the taking and storing of DNA samples and fingerprints under review in the Criminal Justice Bill. Currently, police can only take DNA samples from people once they have been charged with an offence. New rules could allow fingerprints and DNA samples to be taken from anyone they arrest, whether they are charged or not. Gareth Crossman from civil rights campaign group Liberty said that whether the technology allows DNA to be collected on the move or in the police station, they remain worried about the practice. 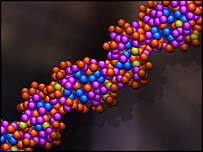 "The concerns we have about DNA remain the same," he said. "The collection, retention and storage of DNA is an extremely imprecise art, with concerns of cross contamination or damage." Mr Crossman said the more samples that were taken and stored, the more problems that could create. Last year, the Court of Appeal ruled police could keep DNA and fingerprints from people charged with a crime, even if they were never convicted. In July, the Home Office announced the number of DNA profiles in the database had reached the two million mark. Home Secretary David Blunkett said DNA and fingerprint databases had become "vital weapons" in law enforcement. In the last three years, there had been a 50% increase in crimes solved using DNA samples, the government said. It plans to expand the database by pumping funds of £182 million from April 2000 to 2004.